It's really hard to get a feel for the way the Sunflower League will shape up after only one week, but generally everyone still tries. I think there will be alot of parody during the 2009 season, as I don't feel than any team (with the exception of Olathe North) is featuring the best squad they have had in years. But that can always change as the weeks roll along. * Player Ratings are subject to change on a week-to-week basis. 1. 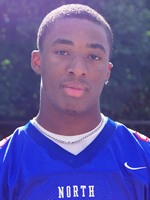 James Franklin, running back, Olathe North: Franklin (below) gets bumped up to the #1 spot after an impressive display against Leavenworth. Despite only toting the ball 15 times, Franklin turned in 132 rushing yards and two touchdowns. After going to halftime with a 50-0 lead, Franklin's services were not necessary in the majority of the second half. 2. DJ Balazs, quarterback, SM West: More than anything, Balazs, a senior, continues to win in his third year as the starting quarterback at SM West. Balazs' presence on offense for the Vikings offers a veteran leader, and stability--a luxury most teams in the Sunflower League don't possess. 3. Lucas Vincent, defensive line, Olathe North: Although Vincent's official stats haven't been released, its safe to say Vincent had quite a bit to do with holding Leavenworth to a mere two first downs in the first half, and only six points total. 4. Camren Torneden, quarterback, Lawrence Free State: Sure, Torneden did drop a few spots in the player ratings over the weekend, but I wouldn't be surprised at all if I have him #1 by season's end again. After all, he did put up 151 yards passing, 62 yards rushing, and two touchdowns in his team's defeat Friday. The number he needs to work on is the three costly interceptions he fired up. By comparison, last season Torneden only threw 11 interceptions in 11 games as the starting quarterback. 5. Matt Nowak, quarterback, SM Northwest: Mr. Consistancy was 12 of 16 passing, for 136 yards, two touchdowns, and an intereption. He also handled SM Northwest's kicking and punting duties without any problems. **More polls have yet to be released for the week, and I will document them when they do come out.